Burger King has added a Flame Grilled Chicken Burger to their already huge menu. 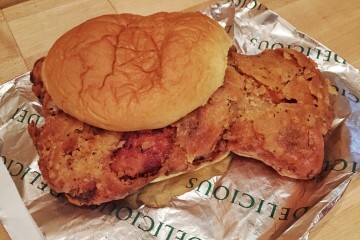 This is now the fourth different chicken sandwich–not counting the Jr varieties. 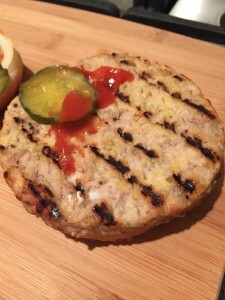 The Chicken Burger is dressed up like a beef burger and we decided to take it for a spin. The Flame Grilled Chicken Burger joins the Tendercrisp Chicken, the Original Chicken and the Tendergrill Chicken sandwiches. 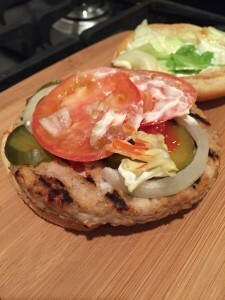 As the name suggests the Chicken Burger is a grilled ground chicken patty which presents you with a second non-fried option. 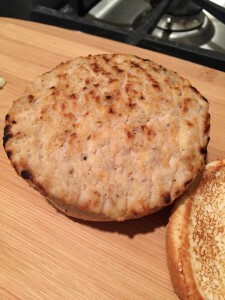 From the non-beef ground meat patty category, one often sees Turkey Burgers, but here we get ground up Chicken like a large chicken nugget. 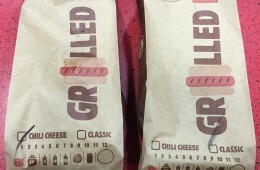 Its then treated to the dramatic exaggerated grill markings and signature BK flame grilled taste. 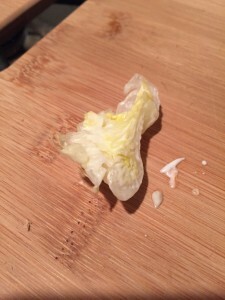 One of the precious few pieces, the inner most core piece, immediately falls out of the sandwich and hits the deck. 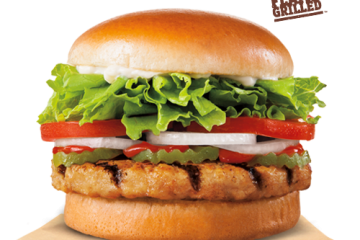 As for the patty, when consumed alone it doesn’t quite taste like much of anything but the smoky BK grill taste. Eaten as a whole, it does give you a sensation of eating a burger with the pickles and mayo. If you’re avoid red meat this could be a good alternative. The patty itself is relatively thick and sizable so it’s a good portion size. Basically the burger is similar to what you got in your school cafeteria growing up. The configuration options for the Bacon Cheese Burger Deluxe does not include mayo so we need to add it in separately. 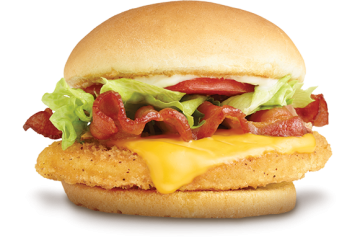 With mayo added to the above stats, you get 340 calories and 21g of fat vs the 480 calories and 25g of fat in the chicken burger. The beef patty burger also has way less sodium. 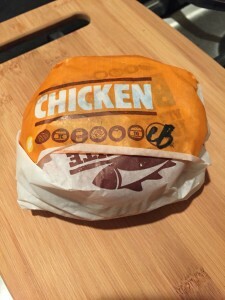 The only areas the Chicken Burger wins is it has lots of protein and a lot less cholesterol. On top of that, if you leave the Bacon Cheese Burger Deluxe as is, it still beats the Flame Grilled Chicken Burger in many of the key categories. 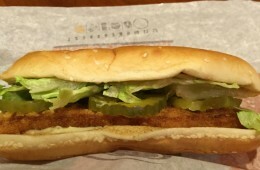 The Chicken Burger suffers from the same old BK problems; bad lettuce, haphazard construction. I think there’s an expectation that ordering a Chicken Burger will be a healthier lunch. Sure Chicken is better than red meat (says some websites) but beyond that, nearly every stat is worse than a comparable beef burger. 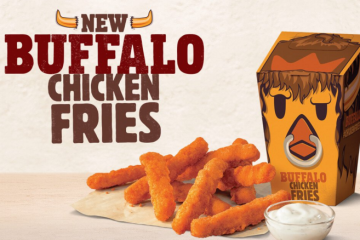 Look, I think Burger King is making the right bet with their overall strategy. 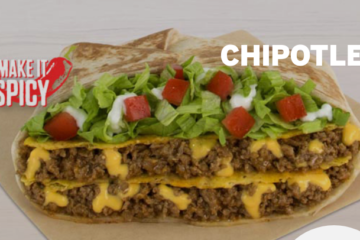 They know they can’t and shouldn’t try to keep up with the arms race of pseudo gourmet menu upgrades that Wendy’s and McDonald’s are currently competing. 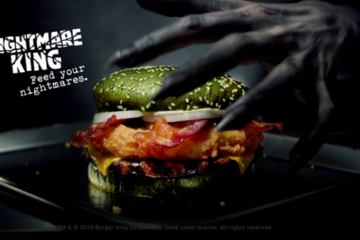 McDonald’s has the stones to suggest that their grilled chicken is made by artisans and Burger King doesn’t even feel comfortable calling their buns brioche without tempering expectations with the “style” qualifier. For all the people who are excited about the addition of new-to-fast-food ingredients like Gouda, there are millions more who are turned off by this. Burger King wants to sit in that void being left by the others and they have a chance to capture a lot of QSR purchases. The problem for me is that I keep going to Burger Kings with low expectations and still end up dissatisfied. If I didn’t get the 2 for $5 deal, I would be very unhappy with this and it’s not the first time. If they could find a way to improve the quality of their produce, while also keeping prices low then Burger King could significantly improve the final product. 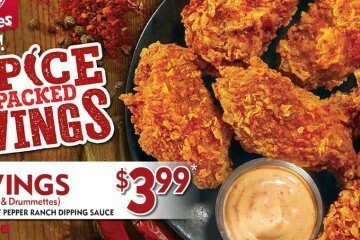 In the meantime, look for the next Burger King menu item to be pulled from your school cafeteria. I’ll keep my eyes peeled for the BK Buffalo Chicken Pizza or the BK Taco Bar. This sandwich was terrible. At 2 for $5 I overpaid by $4. I doubt the chicken patty is actually 100% chicken. The chicken patties at school were gourmet compaired to this. I keep giving Burger King the chance to sway me as a customer, nope, not happening. And yes they fail miserable at delivering edible lettuce. It is awful. Try it to verify my opinion at your own peril. Why doesn’t burger king make a grilled chicken sandwich with low sugar and low salt? Loved it!. Low cholesterol and high protein! Gimme gimme get in my belly! Pretty sure no one in their right mind would go to any fast food place to ‘eat healthy’ (could be wrong about that). However, for those who eat fast food occasionally, simply because they like the taste, but do not eat red meat, this is the perfect solution. Restrictions should be removed as well. 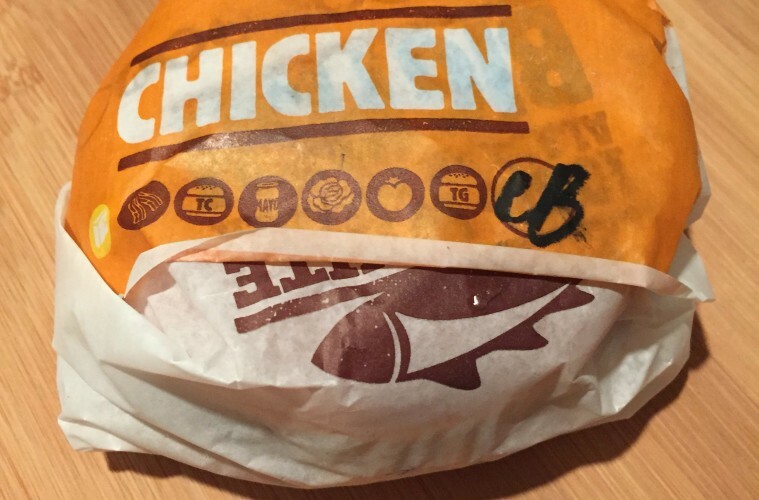 You should be able to get any BK burger with your choice of patty (beef, chicken or turkey). So if someone wants a Whopper, etc. made with a turkey or chicken patty, they should be able to get one. If your images of your burger build is accurate and you are not intentionally being disingenuous, you forgot mayonnaise. You think perhaps that is the reason the nutrition is so different? Little fact here kids, never get mayo on anything, it’s the worst hollow calories ever. 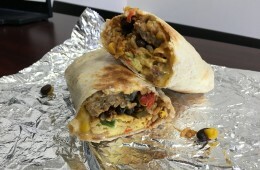 You can almost justify fast food when you forgo the mayo. 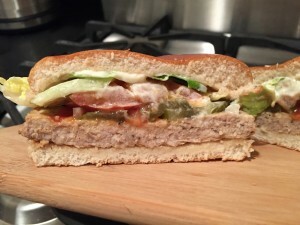 Chicken burger with no mayo, 13g of fat, 370 calories. Whopper no mayo, 22g of fat, 510 calories. Who write this article? 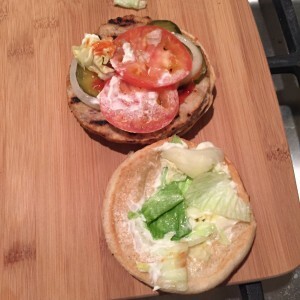 Thanks Jack, you’re right, forgot to include the mayo–that was an accidental oversight. I just noticed now that it is probably because it wasn’t a check box option on the Bacon Cheeseburger Deluxe design options (strangely). To make the comparison more accurate you would need to add 110 calories and 12g of fat that the mayo brings to the table. Even still, the beef burger + mayo is 340 calories and 21g of fat vs chicken burger’s 480 calories and 25g of fat. I don’t know, I just expect a chicken burger to beat a beef burger, call me old fashioned. The nutritional comparison should be between similar sized patties. I’m not saying that either would be a healthy choice. The bcbd has a much smaller patty. You even stated that you didn’t use the whopper patty because it had terrible numbers. The whopper patty is also the same size as the chicken patty. I am not saying that either patty is healthy, but come on. Perhaps you should go into news anchoring… Fox probably has some positions for people that like to compare apples to coconuts. 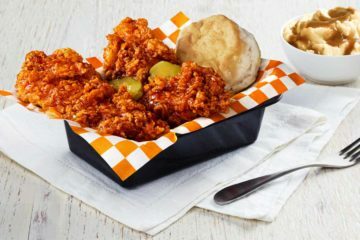 BK chicken taking on KFC, RUKM??? How do you even compare a ground chicken meat patty, flame grilled or otherwise, to a thick chicken breast, battered and deep fried??? Get real, BK. You do you. 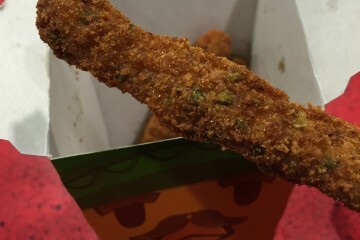 KFC does chicken.